I used to like October a lot, a humongous size of a lot, more than 2.5 acres of a lot. I would count the days leading up to Shoshthi, the days of missing school, the days until the magazine guy would drop off the anandomela on the front porch and the days until we would pack up or suitcases and metal trunks to wait at the small station early in the morning with sleep in our eyes. I still like it a lot though none of the above happens but today I will not tell you about Durga Pujo or its aftermath.It is anyway over and I have written enough posts about it in the last 4-5 years.And honestly some of them even read like pure sentimental crap if I go back and read them all over and I don't want to repeat that. I mean come on it is just one more festival man ? So yes, it is like the Bengali Chirstmas if there is ever such a thing and if I have to explain to my non-Inidan colleagues who I am sure worry why I leave work obscenely early on certain 4 days in October. And we do not have a tree but we have a whole family of idols dressed in the finest jewellery that would give any Christmas tree bauble a run for its money. And everyone gives gifts mostly clothes instead of toasters, and since there is no brilliant tradition of gift receipt in India you end up with a whole lot of unnecessary madras silks and ikkats in colors like parrot green which you wouldn't be seen wearing even in your nightmare. Also if you are married there is enough tension running about who spends the Pujo at whose home and whose Mom gave the more expensive sari and who actually would rather spend Pujo vacation in Mauritius than in the by-lanes of Maniktala. So if you look at it detached with a global angle it is really just one more festival. It took me a whole awful lot of years to understand that and I thought it is best I tell you that early. Instead I will tell you about Ballerina today. Not a Ballerina but The Ballerina as in the ballerina by Bata, the shoe company who cried themselves hoarse months before Durga Pujo, declaring "Pujoy Chai Notun Juto"(You need new shoes for Durga Pujo). Their marketing tactics must have been well researched because my Baba took this to heart and waited all year until September, a month before Pujo, to buy me a new pair of school shoes. It really seems odd now that though the school year started those days in January and later in May or June, we always bought new school shoes just before Pujo in October. Along with the Ballerina, I would also get a fancy pair of Marie Claire open toed sandals with straps that went firmly around one's ankles. But it wasn't the Marie Claire that would be the high point of our shoe shopping, it was always the Ballerina. Baba believed in value for money and a shoe that was to be worn for every single school day needed utmost care and scrutiny in selection. It had to be that perfect elusive size which would fit a growing feet all year round. This needed trial, lots of them. Even after my feet size was measured on that inclined plane which Bata offered by an all knowing Bata gentleman, the probabilities were still wide ranged. As boxes of Ballerina were brought down and piled high, I would wear each pair and then walk around the store in them, very reluctantly if I may say so. Baba would then ask me to jump in those shoes and do short runs. Sometimes a stamp or two in preparation of days when I might need to show my anger. And also marches, left-right-left because the republic day parade was only 3 months away. Walk-Jump-Run-Stamp-March. This routine was followed for at least 5-6 boxes, each followed by vague questions like, Did the shoes hurt ? Did I have to scrunch my toes as I walked around ? Did they tend to slip off when I jumped ? Did I think they slowed me down when I ran ? All this when I was the least athletic kid a school could produce and hadn't won a single race beyond the second grade. This question-answer part of the process made me very nervous. A wrong answer on my part could lead me to be doomed with the wrong pair of shoes for the entire school year. And no one wants to be in wrong shoes, ask Cinderella. I would ho-hum and complain a bit about each pair, nothing significant but how none was perfect and thus try to remain my diplomatic self. Finally after hours a pair of spit polished black ballerinas were decided on and instructed to be packed. The Bata gentleman strangely did not show any annoyance during the process and actually supported the whole ordeal by making serious weighted comments just like my Baba did. The day after the Pujo vacation was over, I would go to school in my new Ballerina and that evening there would be a band-aid on my ankle where the much researched pair hurt the most. 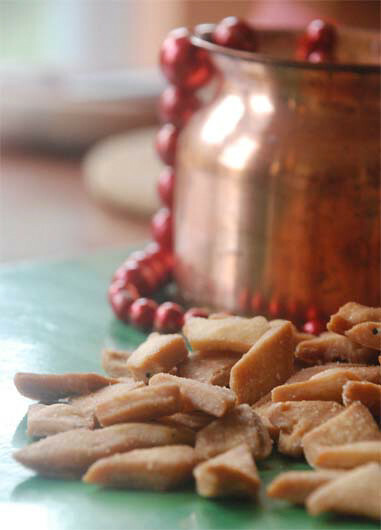 Now to the salty, crunchy, Nimki a staple Bijoya snack along with Narkel Naru and Ghugni. 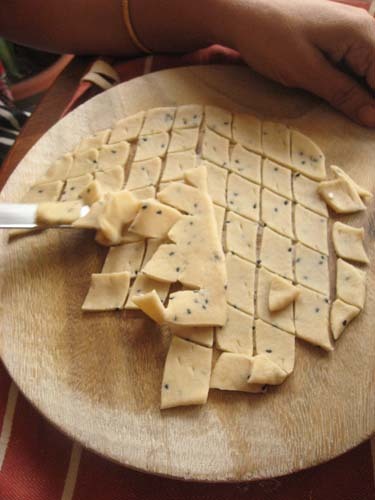 This time three generations of women in our home, sat down together to make nimki. While my Mother made the dough the others pitched in with their own version. I took pictures. Suits me. Now add about 4 tbsp of White oil. 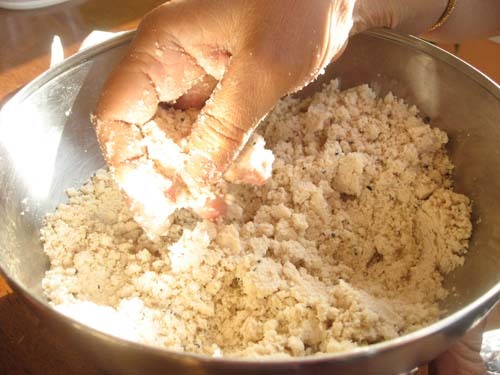 With your thumb and forefinger, rub the oil into the flour mixture so that the flour looks all crumbled. Add the water gradually and work the flour to make a tight dough. Knead the dough well for about 5 mins till it is smooth. Cover with a damp cloth and let it rest for 30 minutes or so. 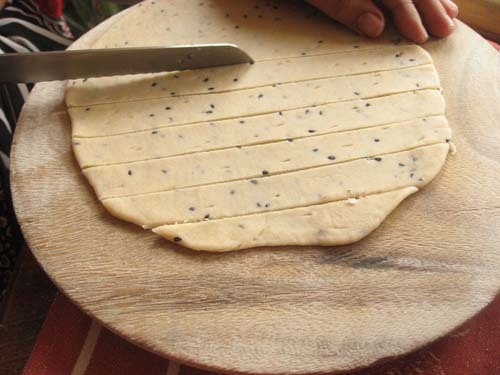 Divide the dough into 4-5 large round balls. Roll out each ball into thin circle. 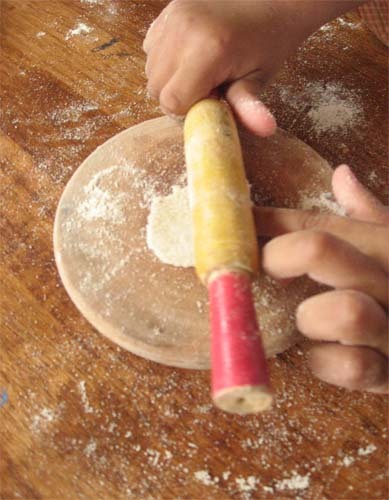 With a fork or sharp tip of the knife prick the rolled out dough to avoid the nimki fluffing up. Now cut the circle in small diamond shapes. Heat enough white oil for deep frying the diamond shaped pieces of dough (about 1 cup). Fry the pieces until they are uniformly browned. Remove with a slotted spoon and drain on paper towel. Once it cools down, store in air tight container. It's such a delight to read your blog :) I've started to follow your blog just recently and have been looking up for many bengali recipes from your blog and following it like a guide book to cook up good bengali recipes ;) As I commented on some of your earlier posts, the dishes did turn out great!! :) Thanks for that! Laughed my heart out at the 'inclined plane' and the 'all-knowing Bata gentleman'!And,remember they mostly used to be bespectacled elderly gentlemen - the 'Jethu jethu' types:)I enjoyed reading you post so much,Sandeepa and it felt so like my own story.Needed the Nimki recipe very urgently for friends dropping in this evening - thanks so much for the recipe!Subho Bijoya! Lovely anecdotes Sandeepa, brings back memories! Things changed so much after '91, with all the choice in the markets now, such experiences can't be shared with younger friends! I miss Bata (when it really did mean something). Happy Festival time to you Sandeepa. Mom is back. Lucky you. Nimki has a festive look- love the last pict! Sandeepa, u took me down the memory lane. Train er upper birth, reading lamp and anondomela pujo sankha, aha! seriously, our childhood was so different. and offcourse, nimki, jeta bheje amar ma horlicks er sishi te rakhto.. akhono serokom e akta kichu te rakhe. tofat aktai - khaoar somay oil er hiseb korte hay! paltay ni ar akta byapar, amar school shoe ballerina ar amar cheler school er jonne 'notty boy shoe'. bata batatei ache, kenar process tao ak ache. half an hour try kore or 1st pair ta kinechi. long live Bata! long live sandeepa and ur blog! hip hip hurraaaaaay! To find that perfect pair of shoe that didn't pinch, wasn't too tight or too loose and would last the whole school year. Thanks for that trip down the Bata shop. What happened to Bata? Nimki looks great. We make the same but with ajwain. Ei weekend a bhabchilam kichu "Bijoya" special banai and was not able to decide between nimki and Malpowa..
After reading your post,,,its Nimki..decided! Feel like munching some, very addictive nimki.. I don't remember them being called Ballerina at all, we just asked for school shoes and out they would come! It's such a sturdy, solid shoe, and Ballerina conjures up a totally different image to me! These days, the only footwear I buy at Bata is Hawais and Dr Scholl's. same story here.. 1 pair of shoe a year with the hawaii choti as bonus and one "airy shoe" - the one with the strap for better places. only i did not march stamp run... had friend in Bata so got discount and who wld get the shoes at her or baba's choice.. i was even told it is better to wear shoes a little tight.. "meyeder pa beshi boro hoya uchit na" .. LOL all in good will. heard the story of chinese girls. oh well.. I agree with you on Durga Poojo.. I have lost the charm ever since I left desh 17 years back..
lots of love to all of you.. sorry aage wish kora hoyni :) hugs. Shubho Bijoya Sandeepa! Your nimkis transported me to my dida's home made nimbi haven post Bijoya :) Loved the shoe tale. We all have our share of ballerina tales, I tell you. Btw, I think the fish fry picture from this blog looked mighty familiar. The part I remember most from my childhood is the shoes - one pair of rainy shoes (from Bata), one pair of Mary Janes (again from Bata),one pair of "canvas" shoes for PT, one "party shoe" for movies and going out and one pair of sandals for everyday evening play in the colony. This was a huge drain I think on my parent's pocket so I was never bought anything more than these in a whole year. And even when I went to college and didnt need all those other shoes and wanted the trendy stuff from Linking Road, I was still refused most of the time - it used to irritate me to no end! Arey ballerina juto protyek bangali chhanar swopno . I still remember my shoe bites . Bata joog joog jiyo ! Your reminiscences of pujo and mine match in toto - oi jonno boli kothao ekta mil acchey rokter :) Nimki goja aar sada narlel naaru are so much a part of my childhood ! Numki looks really good!! I make some evry year for Diwali!! 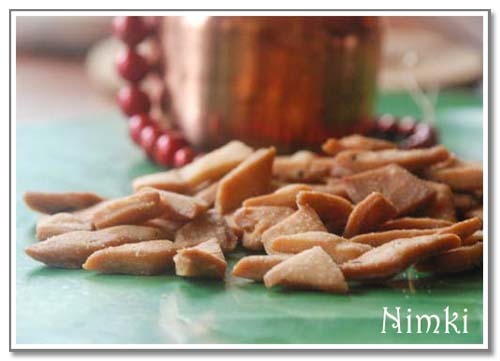 Nimki or Namak Pare is a scrumptious crunchy snack made up of flour. Yeah right they were no young gentlemen there. Did your Mom go back already ? I did manage to fast, I mean eat one time for 4 days as I had intended. The day I was home I found it most difficult though. My respect for all those who do it for a month has gone up immensely. Upper birth e ami ekdom chortam na, lower birth--night light--anandomela, yes :) Eikhane bachcha gulor juto kena amar chotobelar cheye onek different, eibar ami Bata'y giyechilam(City Centre 2), kintu khub slow moving service chilo, kichu kena hoini. Bata is very much there at least in Calcutta. If it was Bata, it would be Ballerina for girls and "Naughty Boy" for boys. It is hard to store Nimkis for long, wonder how many batches my Ma would fry during Bijoya in those days. Thank you. What is your story ? Would love to hear :) And thanks for the link, will talk to the blogger. yes, PT shoes, white canvas, to be washed and dried on Sundays. next time batay jaoar iche thakle camac st batay jeo, service ta thikthak pabe. ami bata theke hush puppies ba Dr Scholl kini. south city te hush puppies er akta nijer outlet hoyeche. next bar thik korechi okhanei kinbo. Thanks a lot..Now a days I am getting addicted to this blog..Bengali people truly believes that the way to anyone's heart is through good food..Bengali food rocks! Hi. Lovely post. I had a question. 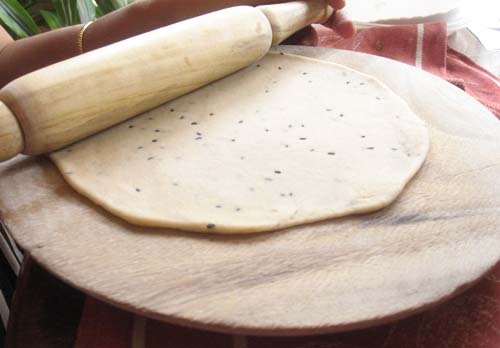 Any particular reason why you added whole wheat (atta) to the maida? I was thinking of making them for my toddler and was wondering if I should add atta..Thanks! Hi. Lovely post. I have a question though. Any particular reason why you mixed atta with the maida? I was thinking of making some nimkis for my toddler and was wondering if I should add atta... thanks!